There's nothing like having the right tool for the job! After years of fiddling around with second hand tools of average quality, I now have a set of the best, thanks to British manufacturer Britool. I also used these superbly made tools on my ride to India and they feel like they will last a lifetime. I suffered from terrible 'numb bum' on the ride to India. Not so on the Bantam, thanks to a Supreme Comfort Seat gel pad. Made from medical grade gel and easy to fit, the pad really made a difference. They are also available for dual seats, pillions and modern motorcycles. I used a bike cover from Specialised Covers on my ride to India. It was superb. The company produce excellent made to measure bike covers, but the Bantam easily fits inside one of their standard size designs. 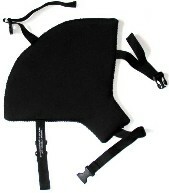 The cover is waterproof, lightweight and clips under the bike front and rear for added security. Ortlieb panniers, again supplied by Lyon Equipment, were used on the Bantam. These fully waterproof panniers have roll top closures and are fastened to the bike with wide Velcro and tension straps. The individual bags can be used as shoulder bags using removable shoulder straps. For stability I tried to keep as much weight forward as possible. This super BSA tank bag came from Redditch-based Classic Bike Shop. I carried heavy items such as guidebooks and useful things such as mobile phone and sun block in it. There's also a handy clear map pocket in the top. To strap awkward and heavy luggage onto my forward crash bars I used Rok Straps, which did the job superbly. The larger pair I also used can hold up to 45KG and are specially designed for motorcycles. They're easily adjustable and can be fitted a number of ways. Another success from Overland To India was the 49 litre Ortlieb Rack Pack from Lyon Equipment. Ortlieb make superb outdoors equipment, tried and tested by travellers for over 25 years. It has a full-width roll closure which allows fast access and keeps water and dust safely on the outside. Another Ortlieb bag, this one a heavy duty, fully waterproof, PS490 Dry Bag from Lyon Equipment I filled it with heavy spare parts, guide books and spare oil and attached it to the front crash bars to keep weight forward and low on the bike.